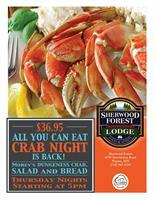 Thursday is Dungeness Crab Night at Sherwood Forest. You have not had crab until you have tastedMorey's Seafood Markets Dungeness Crab. RSVPs and appetites encouraged.